As predicted, I hit 10,000 followers mid-October (October 12th to be specific). What that tells me is that if you have enough data you can absolutely predict Instagram growth with a polynomial equation – at least to a point. I imagine that at certain point you have to hit a plateau of followers depending on what niche you’re in due to the law of platform limitations: if there aren’t a million people interested in cheese, there’s no way you can get two million cheese enthusiasts following your gouda account. Given that I haven’t hit the interest-ceiling yet, this equation has worked for me thus far. The biggest thing that happens to your account when you reach 10k followers (at least right now) is that you can attach links to your stories. Instead of saying “Check the link in my bio” you can directly link to articles, photos, or anything you can hit with a URL. The major advantage of this is that you can share blog posts/content directly with followers who are interested. The second major advantage is that if you are talking about something (a news article, a video, podcast, whatever) it’s a lot easier to give context without having to explain in detail what you’re talking about. One was Women in Tech – they run a (quite literally) award-winning Snapchat account and are branching out into Instagram. Their focus is on increasing the view of women in tech. I had a phone call with them today and will be scheduling a takeover sometime this winter. The second is Vivo. They design and manufacture things like standing desks, mobile desks, desk converters (basically a programmer’s dream). I’ll be trying out a few products of theirs over the next couple months and giving feedback on how it goes. I reached 10k followers right on time! I get to attach whatever links I want to my stories now for more effective posts, and I have some cool collaborations coming up in the next couple of months. I’m sorry, it doesn’t quite work like that! 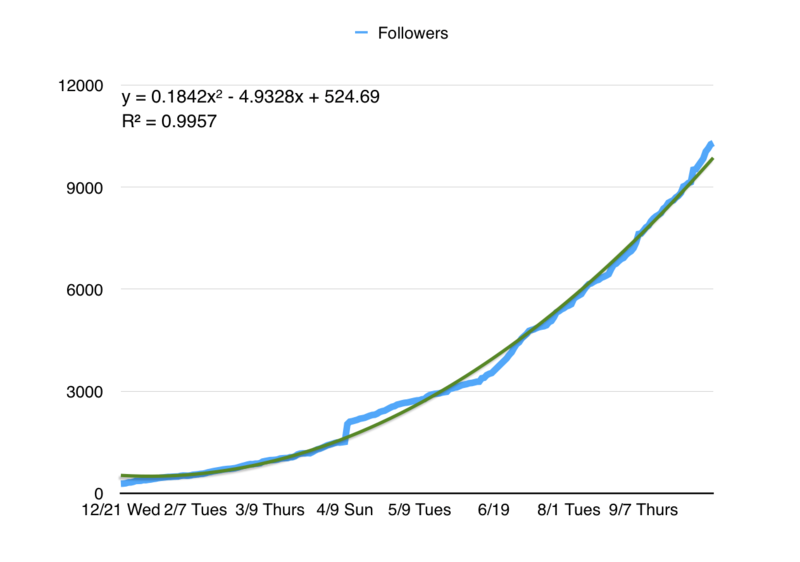 It looks like your following is growing! Hey I’m wondering the exact data points you used to construct your prediction. I am making one for myself. My account @theofficeclipss just hit 10k today, is it true that when you hit 10k you get a better algorithm than accounts under 10k? Hey Nick! Firstly, congratulations! Secondly, great question. The short answer is no. As far as I can tell the mythical algorithm doesn’t change with additional followers. What does happen as you get more followers is more people have “opted in” to seeing your content and are then more likely to engage with it. The “Top” posts on hashtags (or posts on “Discover” pages) are determined based on recency x engagement, so someone who can get 800 likes on something in three hours is much more likely to be a “Top” post than a post with 3 likes over 3 hours. That means the content is then more likely to be seen by other people and those people have the chance to engage with it and your account if they like it. It’s basically a huge snowball effect. For a non-tech person, how can we implement this equation? Excel? Is there a website online. Been out of school 20 years so I honestly don’t even know what R2 means…. You definitely don’t need to be a math major to do this. I actually used a built-in feature on Numbers (if you aren’t familiar with Apple products, it’s like a version of Excel). One thing I would caution is that it’s only really effective if you plan on doing things in a similar fashion for a long time and also keep good data. If you go from posting 7 days a week for six months to 3 days a week that will change your growth pattern significantly. For me it was easy to do it for a year, but going on two years I learned Instagram was lower on my priority list which seriously slowed down my account’s growth.